UNESCO's Memory of the World Programme is an international initiative launched to safeguard the documentary heritage of humanity against collective amnesia, neglect, the ravages of time and climatic conditions, and willful and deliberate destruction. It calls for the preservation of valuable archival holdings, library collections and private individual compendia all over the world for posterity, the reconstitution of dispersed or displaced documentary heritage, and the increased accessibility to and dissemination of these items. The Memory of the World Register is a compendium of documents, manuscripts, oral traditions, audio-visual materials, library, and archival holdings of universal value. Inscription on the Register leads to improved conservation of the documentary heritage by calling upon the program's networks of experts to exchange information and raise resources for the preservation, digitization, and dissemination of the material. The program also has the goal of using state-of-the-art technologies to provide wider accessibility and diffusion of the items inscribed on the Register. Any organization or individual can nominate a documentary item for inscription on the Register. During its meetings, the IAC examines the full documentation of the item's description, origin, world significance, and contemporary state of conservation. In practice, however, it seems that only two proposals per country are considered in each cycle. In 1992, the program began as a way to preserve and promote documentary heritage, which can be a single document, a collection, a holding or an archival fonds that is deemed to be of such significance as to transcend the boundaries of time and culture. This recorded memory reflects the diversity of languages, people, and cultures. UNESCO, the world agency responsible for the protection of the world's cultural and natural heritage, realized the need to protect such fragile yet important component of cultural heritage. To this end, the Memory of the World Programme was established with the aim of preserving and digitizing humanity's documentary heritage. Bureau: Maintains an overview of the Programme between IAC meetings and makes tactical decisions in liaison with the Secretariat, reviews the use of the Memory of the World logo, and liaises with national Memory of the World committees and monitors their growth and operation. Technical Sub-Committee: Develops, regularly revises and promulgates information guides on the preservation of documentary heritage, and offers advice on technical and preservation matters. Marketing Sub-Committee: Develops strategies for awareness raising and for increasing financial support for Memory of the World, implements a marketing plan, and compiles and reviews guidelines for the use of the Memory of the World logo. Register Sub-Committee: Oversees the assessment of nominations for the Memory of the World International Register and provides recommendations, with reasons, for their inscription or rejection to each meeting of the IAC. Of the 301 documentary heritage items listed on the Register by 2013, 181, or more than half of the documents, are accounted for by the region encompassing Europe and North America, which includes 39 countries and/or territories. The program is not without controversy. During the 2015 cycle, for example, there was a significant degree of conflict within East Asia, as registry with the MOW Program was becoming viewed as an approval of particular views of contested history, specifically with respect to the Nanjing Incident and the comfort women. 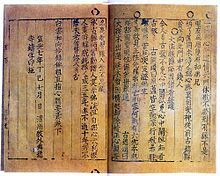 The Jikji Prize was established in 2004 in cooperation with the South Korean government to further promote the objectives of the Memory of the World Programme, and to commemorate the 2001 inscription of the country's Jikji on the Register. The award, which includes a cash prize of $30,000 from the Korean government, recognizes institutions that have contributed to the preservation and accessibility of documentary heritage. The prize has been awarded biennially since 2005 during the meeting of the IAC. ^ A. The Europe and North America region includes the Transcaucasian States of Armenia, Georgia and Azerbaijan, Russian Federation and Turkey. Furthermore, transcontinental documentary heritage like the Archives of the Dutch East India Company, shared among India, Indonesia, Netherlands, South Africa & Sri Lanka, has been classified under this region. The item from Netherlands Antilles is also included in this region, considering its political affiliation with the Netherlands. ^ a b c d e f g h i j k "UNESCO Memory of the World Programme: The Asia-Pacific Strategy". UNESCO Memory of the World Programme. Archived from the original on 2005-02-28. Retrieved 2017-08-01. ^ "Official website". UNESCO. Retrieved 2017-08-10. ^ a b c d e "Twenty-three new inscriptions on Memory of the World Register of Documentary Collections". UNESCO Press. 2003-09-01. Retrieved 2009-09-06. ^ "Memory of the World: General Guidelines to Safeguard Documentary Heritage". UNESCO. February 2002. Archived from the original on 2005-04-15. Retrieved 2009-12-08. ^ a b c d e "Twenty-nine new documentary collections inscribed on the Memory of the World Register". UNESCO Press. 2005-06-21. Retrieved 2009-09-06. ^ a b Jasmina Sopova (2007-06-20). "Thirty-eight new inscriptions for Memory of the World Register". UNESCO Press. Archived from the original on 2009-11-11. Retrieved 2009-09-06. ^ a b c "Third Meeting of the International Advisory Committee of the Memory of the World Programme". UNESCO Memory of the World Programme. Archived from the original on 2008-05-03. Retrieved 2009-09-06. ^ a b c "Fourth Meeting of the International Advisory Committee of the Memory of the World Programme". UNESCO Memory of the World Programme. Archived from the original on 2008-05-03. Retrieved 2009-09-06. ^ "International Advisory Committee". UNESCO Memory of the World Programme. 2009-08-11. Archived from the original on 2016-03-11. Retrieved 2009-12-09. 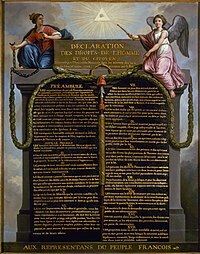 ^ "Original Declaration of the Rights of Man and of the Citizen (1789-1791)". UNESCO Memory of the World Programme. Retrieved 2009-09-07. ^ "Fifth Meeting of the International Advisory Committee of the Memory of the World Programme". UNESCO Memory of the World Programme. Archived from the original on 2007-06-27. Retrieved 2009-09-06. ^ "Sixth Meeting of the International Advisory Committee of the Memory of the World Programme". UNESCO Memory of the World Programme. Archived from the original on 2005-03-25. Retrieved 2009-09-06. ^ a b c "Seventh Meeting of the International Advisory Committee of the Memory of the World Programme". UNESCO Memory of the World Programme. Archived from the original on 2005-12-20. Retrieved 2009-09-06. ^ "Eighth Meeting of the International Advisory Committee of the Memory of the World Programme". UNESCO Memory of the World Programme. Archived from the original on 2006-06-03. Retrieved 2009-09-06. ^ Joie Springer (2007-06-20). "Thirty-eight new inscriptions for Memory of the World Register". UNESCO Press. Archived from the original on 2015-03-14. Retrieved 2009-09-06. ^ "2009 Nominations". UNESCO Memory of the World Programme. Archived from the original on 2009-08-04. Retrieved 2009-09-06. ^ MotW IAC (2011). "10th Meeting of the International Advisory Committee Memory of the World Programme Manchester, United Kingdom, 22-25 May 2011 REPORT" (PDF). UNESCO. Retrieved 2012-01-10. ^ MotW IAC (2013). "55 new inscriptions on UNESCO Memory of the World Register". UNESCO. Retrieved 2013-08-05. ^ MotW IAC (2015). "12th Meeting of the International Advisory Committee". UNESCO. Retrieved 2016-04-29. ^ MotW IAC (2015). "13th Meeting of the International Advisory Committee" (PDF). UNESCO. Retrieved 2018-07-12. ^ "UNESCO/Jikji Memory of the World 2009 Prize awarded to National Archives of Malaysia". UNESCO Memory of the World Programme. 2009-08-21. Archived from the original on 2015-03-14. Retrieved 2009-09-07. ^ "National Archives of Australia to receive UNESCO/Jikji Memory of the World Prize". UNESCO News Service. 2011-05-30. Archived from the original on 2015-03-14. Retrieved 2012-01-10. 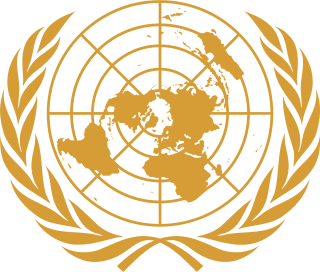 The United Nations Educational, Scientific and Cultural Organization (UNESCO) World Heritage Sites are places of importance to cultural or natural heritage as described in the UNESCO World Heritage Convention, established in 1972. Spain accepted the convention on May 4, 1982, making its historical sites eligible for inclusion on the list. UNESCO established its Lists of Intangible Cultural Heritage with the aim of ensuring better protection of important intangible cultural heritages worldwide and the awareness of their significance. This list is published by the Intergovernmental Committee for the Safeguarding of Intangible Cultural Heritage, the members of which are elected by State Parties meeting in a General Assembly. Through a compendium of the different oral and intangible treasures of humankind worldwide, the programme aims to draw attention to the importance of safeguarding intangible heritage, which UNESCO has identified as an essential component and as a repository of cultural diversity and of creative expression. The first inscriptions on the UNESCO Memory of the World Register were made in 1997. By creating a compendium of the world's documentary heritage—manuscripts, oral traditions, audio-visual materials, library and archive holdings—the program aims to tap on its networks of experts to exchange information and raise resources for the preservation, digitization, and dissemination of documentary materials. As of 2013, 193 documentary heritages have been included in the Register, among them recordings of folk music, ancient languages and phonetics, aged remnants of religious and secular manuscripts, collective lifetime works of renowned giants of literature, science and music, copies of landmark motion pictures and short films, and accounts documenting changes in the world's political, economic and social stage. Of these, 97 properties were nominated by countries from the region of Europe and North America. The UNESCO has designated six World Heritage Sites in the Philippines. The UNESCO World Heritage Sites are places of importance to cultural or natural heritage as described in the UNESCO World Heritage Convention. Alissandra Cummins was the Chairperson of the UNESCO Executive Board (2011-2013). She is from Barbados and is one of the leading experts on Caribbean heritage, museum development and art. Alissandra Cummins is Director of the Barbados Museum & Historical Society and she is a lecturer in Museum and Heritage Studies at the University of the West Indies. She is board chair of International Journal of Intangible Heritage. She is on the board of the International Coalition of Sites of Conscience, and the International Journal of Museum Management and Curatorship. The heritage preservation system of South Korea is a multi-level program aiming to preserve and cultivate Korean cultural heritage. The program is administered by the Cultural Heritage Administration, and the legal framework is provided by the Cultural Heritage Protection Act of 1962, last updated in 2012. The program started in 1962 and has gradually been extended and upgraded since then.